We believe the voice of CTFOB needs to be from the disability community and we are committed to providing a platform for all to speak out about their experience with advertising and the media. Our hope is that their voice will be heard and changes will be made in the industry to ensure inclusion of the disability community in ad messages all the time. In fact, the disability community remains the only minority that does not discriminate. Any person of any race or religion can become a part of this community at any time. Because of that we are advocating for the entire human race. Inclusion is important and you are going to hear why. Want an opportunity to be part of our 2017 Couch Series and use your voice and help us to help change the advertising industry? Please use our contact form below to let us know! In the latest Changing the Face of Beauty Couch Series, ‘Dandy Walker’ singer and songwriter Cassie Beer describes the experience of raising her son Avram, who was born with 13 different malformations in his brain, the meaning behind her lyric writing, and why she hopes Changing the Face of Beauty isn’t needed in the near future. We could not be more proud to launch out 8th “Couch Series” episode during Down Syndrome Acceptance Month. Although we did not plan for this message to launch in October, it turned out to be the PERFECT time. Please take a minute to listen to Dr. Jamie McClintic talk about her and her daughter Maddox journey with Down syndrome. This month, we bring you the story of Rajee Aerie on our #facemybeauty couch series. Rajee, an aspiring model and actress who happens to have a disability, describes the lack of casting of people with disabilities in media and advertising. Changing the Face of Beauty is so excited to bring you the story of Jeff Rose on our #facemybeauty couch series. Jeff, a former model and now motivational speaker, speaks out on why being seen in the media matters to him and why it should to you too. We are so proud to have Daniel Smrokowski from Special Chronicles on our Couch Series! Daniel works hard every day to challenge the media message and empower the disability community. Here is his story! If you believe in what Daniel is saying please share with your community and help us Change the Face of Beauty! Our Couch Series is back with another amazing story! This week’s special guest: author, and preschool teacher Rena Rosen. Hear her AMAZING story and what she has to say about why inclusion is important! If you believe in what Rena is saying please share with your community and help us Change the Face of Beauty! Changing the Face of Beauty looks for voices from the disability community that have a passion for inclusion in the media and advertising. Rob Gregory is a retired Creative Director turned Professional Photographer and he shares his story on our couch. This month’s Couch Series sits down with a passionate advocate for Changing the Face of Beauty. Owen Chaidez talks about “Owen’s Playground”, his desire to star in a Buzzfeed Taste Test Video, and his role in our Educational PSA Program! 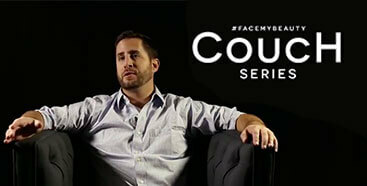 Next Up on the #facemybeauty Couch Series, we bring you the story of Dr. Jamie McClintic. Dr. McClinitic, who suffers from severe hearing impairment, describes the difficulty of growing up with a disability and how that has made her stronger!